My life as a Crohnie! For our fourth annual Pin Up Picnic in the Park we shall be running our charity raffle. It's the early stages yet but we already have some incredibly generous donations from Sarah's Doo Wop Doo's, Le Keux Cosmetics, Spex Pistols and Heart of Haute, hopefully that is just the beginning of a fabulous bundle of prizes to give away in exchange for us raising as much as we can for Crohns and Colitis UK. I myself have Crohns disease (Charlotte) and have been diagnosed almost 16 years now. Crohns is an incurable disease and one day I hope that will change, along with many other sufferers out there. With raising as much as we can to donate to the charity we will be funding new research, new drugs and new ways of understanding how and why it occurs. As I've chosen a disease very close to my heart and part of my daily life I thought I would share with you my Crohns disease story and if you have one please feel free to leave a comment for us below; What does and doesn't work for you? What medicine or herbal remedies you've tried? I am very open to hearing everyone's thoughts and opinions who are affected by Crohns or Colitis as I believe both are very similar in certain ways. Back in 2003 I was walking to school like every other day however this time I almost collapsed on the way there. As soon as we reached the school gates my friend took me straight to the nurses office who noticed how sickly and tired I looked and called my au pair who came to collect me. This was the first time anyone realise something was very wrong. When I got back to my au pairs house, she told me to go upstairs and got to bed to sleep. She came up to bring me a glass of water and I was getting changed, this was always something I felt self conscious about as I knew I was painfully thin. She noticed too. My dad worked away all week and was home for weekend but my au pair had passed on concerns and he came home. It seems like a whirlwind from there as I was then booked in for a consultation with a doctor who noticed too at the age of 13 I was 4' 9" and weighed only 3 and a half stone. I looked incredibly ill, I was weak, my hair was thinning and falling out and I had sores all over my body. I had known of course I was ill for a long time but didn't want to cause a fuss, its difficult when you don't want to disrupt other peoples lives and I felt like it would sort itself out. The first thought of course, was that I had an eating disorder. I had been hiding food, throwing my lunches away at school and eating as little as possible. But this wasn't because I was worried of putting on weight, this was because food caused me pain. My stomach would constantly hurt, it would be excruciating and would cause me to double up. I know what you're thinking, who feels like that and doesn't see a doctor. After I was diagnose in 2003 they suggested there was a high chance I had actually had it for 3 years already. From the day I collapsed I didn't go back to school for 6 months, aside from one brief day I went in as my consultant said I should be fine to go back and I collapsed again from exhaustion and being too weak to hold up my own body. It was a long 6 months, my dad had time off work, my brother felt a bit neglected, family spent most their time crying and somehow I was as tough as anything. If people cried around me I asked them to leave, I believed I could beat this and it wasn't going to beat me. I spent the majority of those 6 months bed bound. Walking was tricky, even getting up to make the short walk to the bathroom felt like a mammoth task and would result in me having to lie on the bathroom floor for 20 minutes to half an hour. I was painfully frail, my skin looked translucent, my hair was so thin and my body covered in bed sores. I couldn't stand anything around my neck it made me feel sick, so even in freezing cold winter I refused to wear a coat or scarf as the sensation was horrid. I had to wear off the shoulder tops and mainly these long black skirts (I had like three of them) that were a size 4 that I had all taken in because nothing fit. These were very very low times and looking back it's hard to think I got down so low and didn't say something sooner. Thanks to Professor Booth and all the amazing nurses at The Children's Hospital that began my journey to getting, feeling and looking 100 times better. I was an out patient at Birmingham children's for years, we went on a Friday for check ups, bloods etc and to check my weight. At the time there weren't any miracle drugs or a quick fix you could either go on to steroids or try a liquid diet of Clinutren. I was adamant I wasn't going to take steroids and opted for the liquid diet. I spent 3 months on just 5 - 6 clinutren a day and aside from that I could have foxes glacia mints, a glass of Fanta or Sprite and that was your lot! I found it incredibly difficult, the first time I had to drink one of the clinutren (which is about the size of a Ribena carton) it took me an hour. The taste was interesting to get used to, being watched while I drank was off putting but I did it. After 3 months on my liquid diet I felt better, I started to go back slowly on to solid food and even began attending school again. Of course we had to carry on check ups or the next three years but everything seemed to be going well. The thing is of course with Crohns disease, it never truly goes away. It can even disappear from it original site and re occur somewhere else along the dietary tract and when it does come back again it's known as a flare up. I was incredibly fortunate to have 13 years Crohns symptoms free. No pain when I ate, no problems with tiredness, fatigue, drowsiness or loosing weight. Then in 2014 I started to notice I was having awful stomach pains creeping in. Within the space of a few weeks I dropped from a large size 12 almost 14 down to a size 8 - it literally fell off. Working in retail at the time the ladies I worked with expressed jealousy of how easy it was for me to loose weight, I understand it was all meant to be taken light heartedly but in reality it's a serious issue for me because I can't take any nutrients from food and things go down hill very fast. After many many appointments with my local doctors, who didn't seem to believe me I finally got a referral to the Queen Elizabeth (anyone who has watched The Surgeons programme on the BBC will know how incredible the doctors are at the QE) also incidentally I was born at the QE (the old building still on the site) so it felt almost kismet for me. We started with a liquid diet again and going for constant check ups, on my weight, my bloods, my stool and MRI scans as well as a colonoscopy (not the nicest of things but necessary) sadly as it's my bowl that is affected (small intestine) and Crohns is usually a swelling of the infected area I can no longer have colonoscopies preformed. It took almost 4 years of constant appointments, moving from liquid diet to a drug called azathioprine to finally, finally after years of asking! be put on Humira. This is a biological drug that can be administered and taken at home. Alongside my Humira I still take my azathioprine and all my supplements as I have found one drug affects another part of what my body can absorb, ie. now I have a vitamin D deficiency, Iron deficiency and low calcium. But in order to have my crohns managed sadly something else generally has to suffer. After starting humira I felt incredible, utter euphoria no longer did I have pain, constant pain and even worse when I ate, not knowing when a flare up would happen, where I am yet again bed bound and constantly being sick, finally the humira leveled everything out. The only issue I have found since starting my new medication is that I have put on weight, more than I would like. Due to my medication, due to what I can eat and what I have to avoid it's just what happens but for me of course it matters. It does make me feel down sometimes that I'm not as thin as I was and not the same shape. But that's a personal battle. I know I'd never want to get down to being sickly thin again but I do have my days where my weight was steady and held strong to have a 26" waist - but of course my health comes first! I do hope some people out there also suffering can see similarities in what we all go through, if anyone would like to talk about their experiences I'm always here. And obviously there is a fair bit missed out because I could talk forever about times spent crying on the phone to doctors secretary's, answer machines and all the other bits. 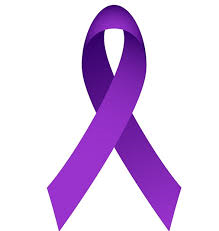 This disease is so important to raise awareness for as over 115,000 people in the UK alone are diagnosed with Crohns. It's a difficult disease as when your feeling okay or just not at your worse it's quiet the invisible disease. I think people can feel like your putting it on when you call in sick or you aren't as bad as you make out you are but believe me, as a sufferer I hide a lot of how I feel and just get on with it. so when I do mention feeling bad, it's hit the top of what I can bare. The British Belles Tee Launch! It's been a long process of choosing what to create; large logo, small logo, plain tee, baseball tee and many back and fourth chats about colour and design but thanks to an incredible illustrative designer Tom of Thomas Rooney Designs our dream became a reality. Tom has a BA in Theatre, Performance and Event design and a BTEC in photography, however his skills are far broader than just these two qualifications. 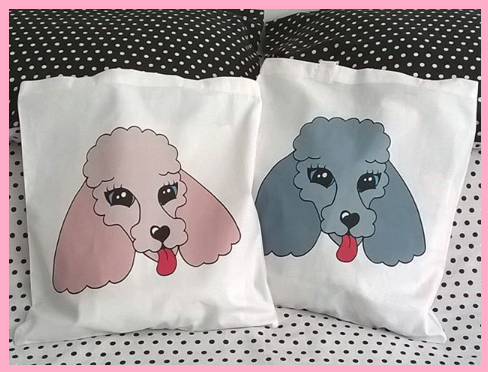 We were lucky enough to have him donate two personal designed poodle totes to the picnic the year before last and now we've been even more fortunate to have him design some logos for us. This year we have the absolute pleasure of having a fantastic prize donated by the one and only Rockalily cuts. If you’ve followed Rockalily cuts from the beginning the founder Ree Ree started of with an amazing lipstick line which to this day I still utterly miss as I finished my last lipstick a year or so ago now. Since the lipstick loving days Ree Ree has gone on to run a very successful hair salon business in the heart of London. BB: When did you start Rockalily cuts and what made you decide to go in to the hair salon business? 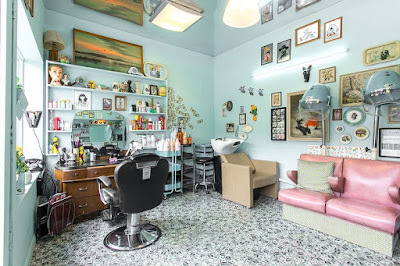 Ree Ree: I opened the salon back in 2012, so our 6th birthday is just around the corner. 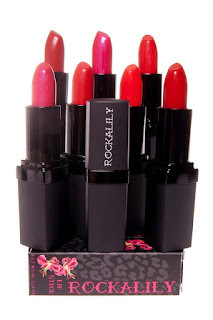 I opened it off he back of my lipstick brand Rockalily Lipstick, when I decided I wanted to take my mini-brand further. 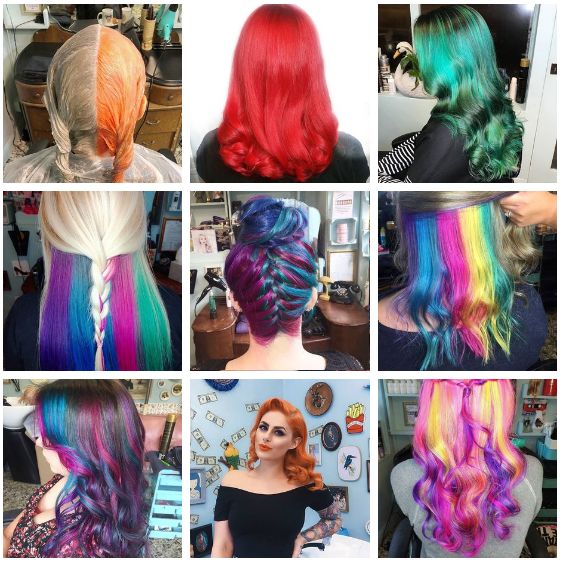 It seemed like a natural progression, from beauty to hair. I'd no prior experience in either industry, but I made up for it with my enthusiasm I think! BB: I know in the past you loved pin up, I remember following you on various social media and loving your style and hair, you always look amazing. What would you say your style is these days and do you think it has transformed over the years? Ree Ree: I've definitely transitioned a little, but I don't know many people who look the same year after year. My blog initially followed my daily outfits, as I discovered the confidence to dress 'alternatively' and bought a new rockabilly/vintage wardrobe. Over the years I've become a little more mainstream again, the jeans have returned, and my eye liner flicks and tattoos are often the only hints of rockabilly style in my look. I still dabble though, I'm just much more casual these days. BB: What is your favourite client transformation in the salon? And do you have any pictures you can show us of it. Ree Ree: Oh gosh we have so many amazing transformations, from long to short, from black to rainbows, I'm really not sure I can pick one. BB: Do you ever miss your lipstick line and what made you decide to end production? Is there a possibility it will come back in the future? Ree Ree: My mother certainly still misses it, and she's still using up some of her old stock! I'm told the same by customers on twitter which is really sweet. It was a great quality lipstick that has proved hard to replace it seems. I wanted a different working day, and I wanted to create something bigger than the lipstick could ever be. So it was time to move on. 1. If you want to run a business take more time reflecting on what people want to buy, rather than what you want to make/sell. 3. Invest time and love in your friends as much as you can. BB: Also a sneaky little one for our readers, I remember a while ago you spoke about having a celebration event for Rockalily to celebrate it is this something that is still on the cards? Ree Ree: I really hope so! I can't believe that was April 2017, but yes I'd love to do a birthday event when we turn 6. Just got to get the right idea nailed! I just wanted to say thank you to Ree Ree and all of the team at Rockalily cuts for taking the time to answer our questions and of course for the prize donation. Our favorite Le Keux cutie, boss ladies sister and all round master of hair and make up across the Le Keux stores gave us the pleasure of having a little interview with her, ahead of her trip to Viva Las Vegas (can you say jealous much!) where she will be competing in the Viva Las Vegas Pin Up Pageant, she 100% has our vote! For those of you who don't know, VLV is one of the BIGGEST pin up / vintage / rockabilly weekenders around. Held in it's namesake Sin City itself, us belles can only but dream of one day getting to attend this weekend which would be a once in a life time, dream come true. 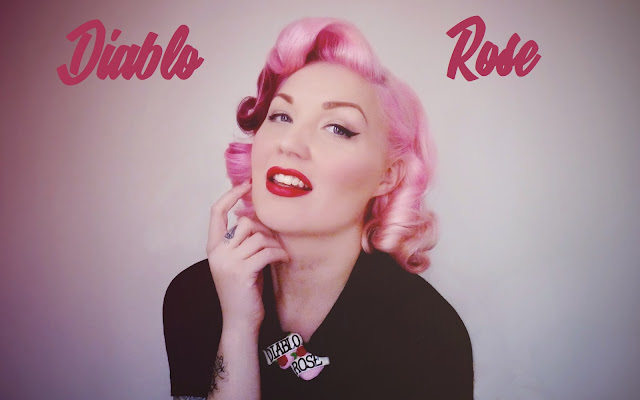 Diablo Rose hit the pin up scene with a bath bomb explosion of signature pink locks that always look quaffed to perfection in so many innovative and delicate styles. She was the leader of the original Le Keux Girls, gracing many covers such as chap magazine and since has recently launched her own line of incredible bold print tees. 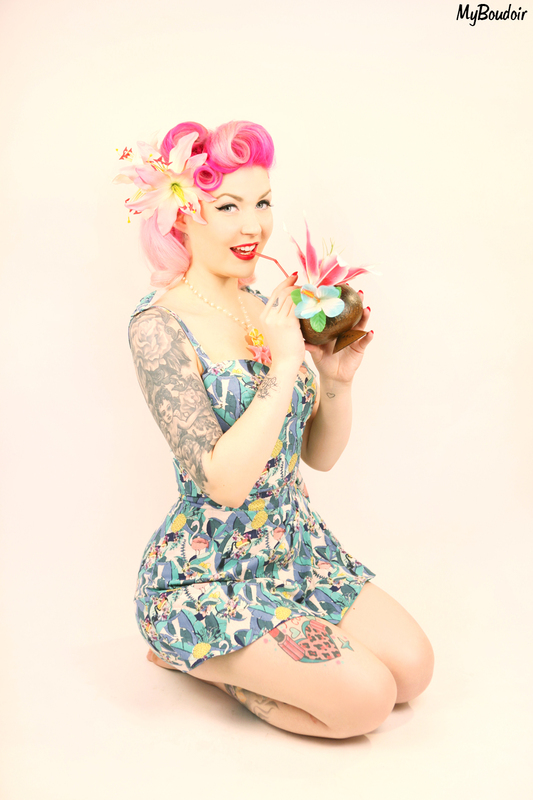 What made you decide to enter this years VLV pin up comp? I think this year I finally decided to stop putting things off, believe in myself, and just go after the things I really want to do! I've dreamt about entering Miss Viva Las Vegas for years, I've even written my application a few times but never actually applied because of self doubt and all those other things which sometimes cloud our thoughts. But when I finally clicked 'enter' for this years competition it was the most amazing feeling of accomplishment, and that alone was a huge boost for me. Getting to the finals and actually being able to realise this dream of mine is going to be life changing and I'm so glad I finally took the plunge. Sometimes it takes a little time to build ourselves up to things, but I can tell you, it's completely worth the wait. Have you entered a pin up competition before? This will be my first pin up pageant and to say I'm nervous would be an understatement but I'm actually incredibly excited and ready to take on this new experience! I've been chatting with the other entries and finalists online for a few months now and they are all so lovely and supportive, so I just know it's going to be an incredibly uplifting and empowering experience. What would your all time perfect outfit be to wear at the competition, if money and reality weren't an issue? Ooooh that's a good one, I think if I could combine pastels, tulle, sparkles, bows, a hint of vintage Dior couture, a little Disney inspiration and maybe even some florals in a way that didn't look like a crazy Easter egg that would be amazing. Or maybe I just embrace the Easter egg look and go with it, because if it makes you feel good and happy then do it!! I'm most excited about just trying to take in as much of the Viva Las Vegas Rockabilly Weekend as I possibly can. Vegas is my favourite place in the world and to visit with thousands of like-minding vintage and pinup lovers is going to amazing. I can't wait to meet everyone, swoon over hair and makeup, dance, shop, maybe even get a new tattoo! I'm also so excited to be going with one of my favourite people in the world, my pal Lisa, we're going on a proper girls trip and I am SO excited to share all of this with her because she's amazing! And now a little hair and make up question, if you could style anyone's hair or make up who would it be and why? Oh goodness, there's so many stars who I admire, style wise! There's obviously Marilyn Monroe and Dita Von Teese, but I also love those modern twists, like Gwen Stefani. She combines a classic pin up look but gives it an edge and I've always really loved that. But honestly, I LOVE styling my regular customers, being able to understand their own ideal of what makes them feel beautiful in their own skin, then adding a little pin up style to it makes me so happy. When I finish up a hair and makeup appointment and my customer can look in the mirror and tell herself that she looks pretty just makes my day, because really it's those real moments of self confidence which matter the most when I think about what I do for a living. Also would you consider doing a hair and make up course tour? be it European or international? Absolutely! I would love to travel more, and I'm really hoping to be able to get out and about and do more teaching in 2018, we're working on a few new things and plans at the moment so keep an eye out on my pages! Thank you ever so much Diablo for taking the time to chat with us and we will be sure to do a follow up after the big VLV Pageant! EEEEEK! we're all behind you! !